Welcome back to the Mystery Seasonal Sampler. Have you been keeping up with me each month? If you're new here, I post a block(s) each month on the second Sunday of the month. 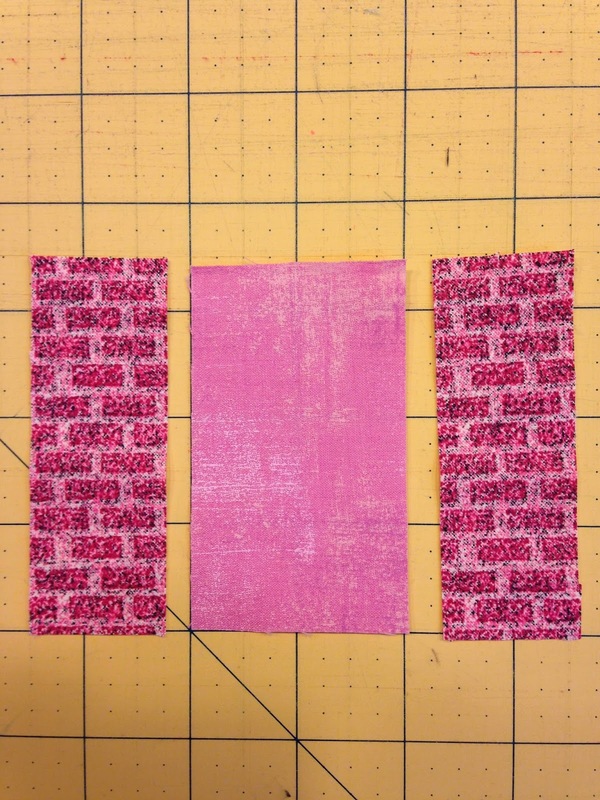 I started this Mystery Seasonal Sampler in January 2014. 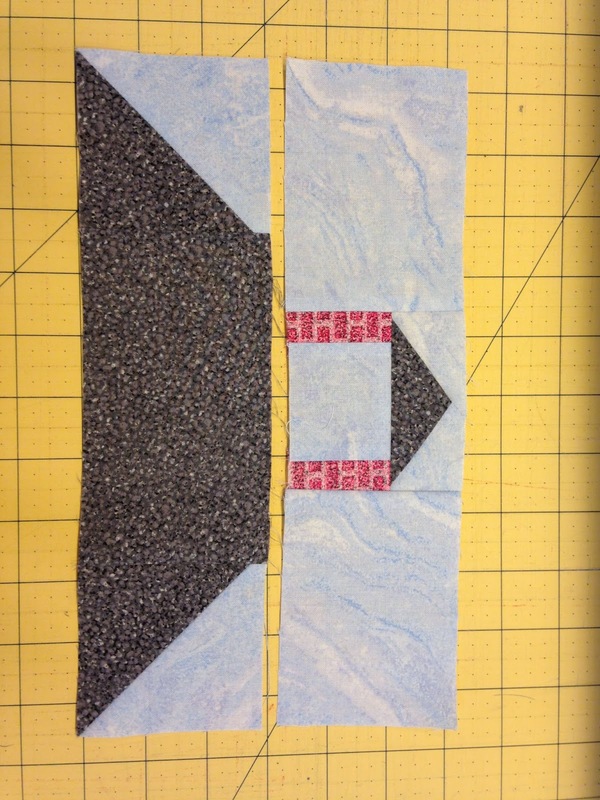 The quilt will finish as a large queen size quilt. 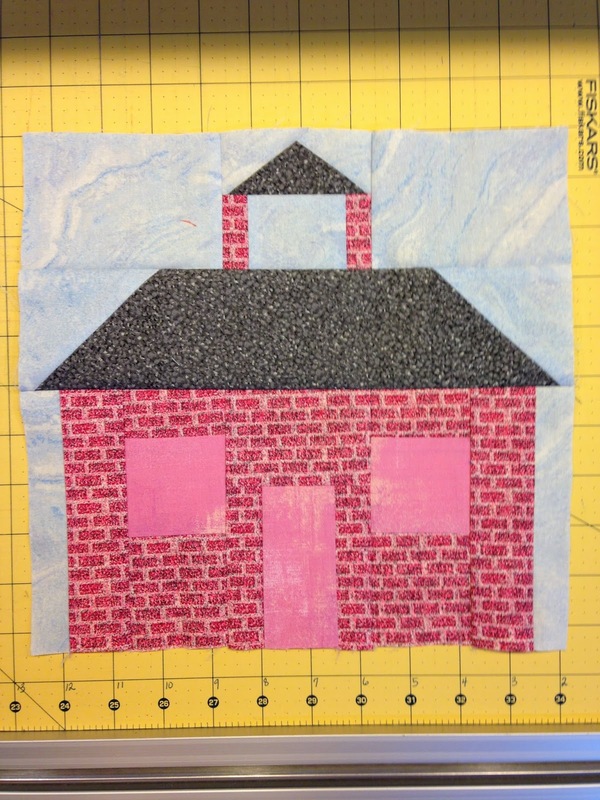 September is always a reminder of school for me so of course, this month's block is a school house. 2. 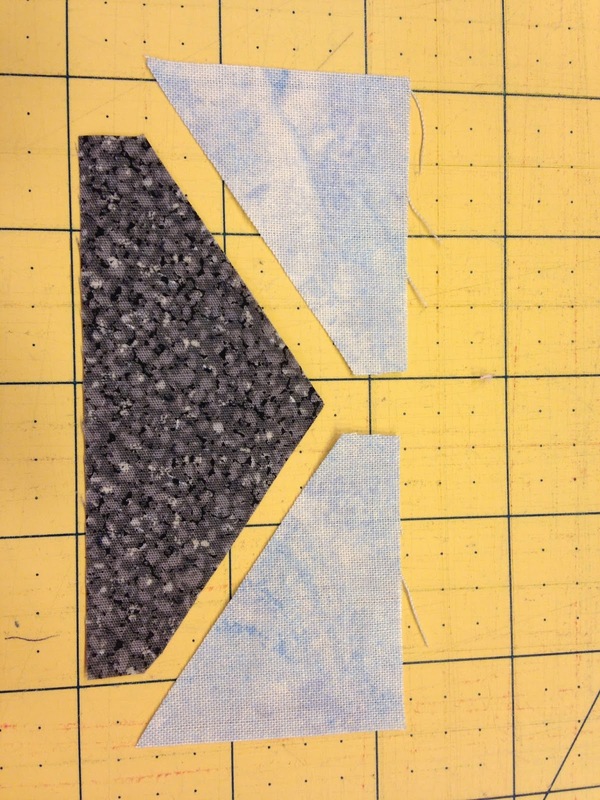 Make the 2 half square triangles. 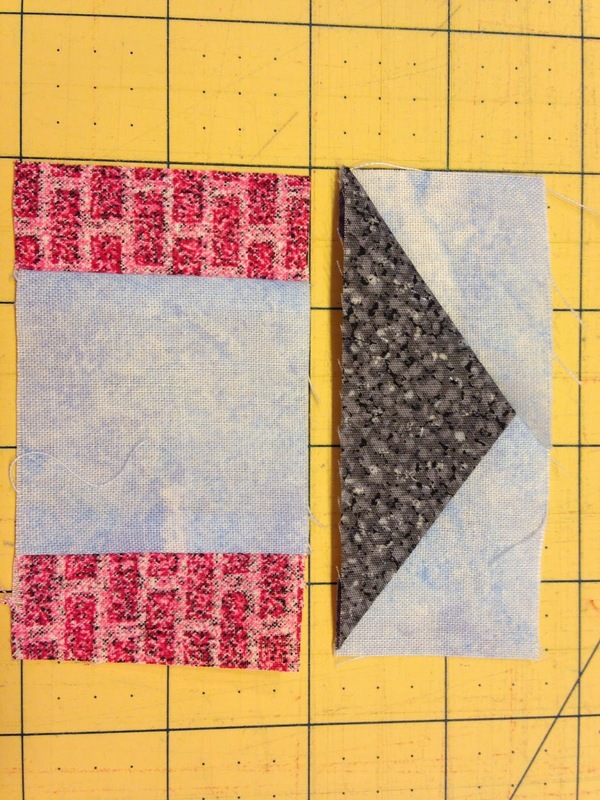 Pair a background 3 1/2" square with a roof 3 1/2" square. 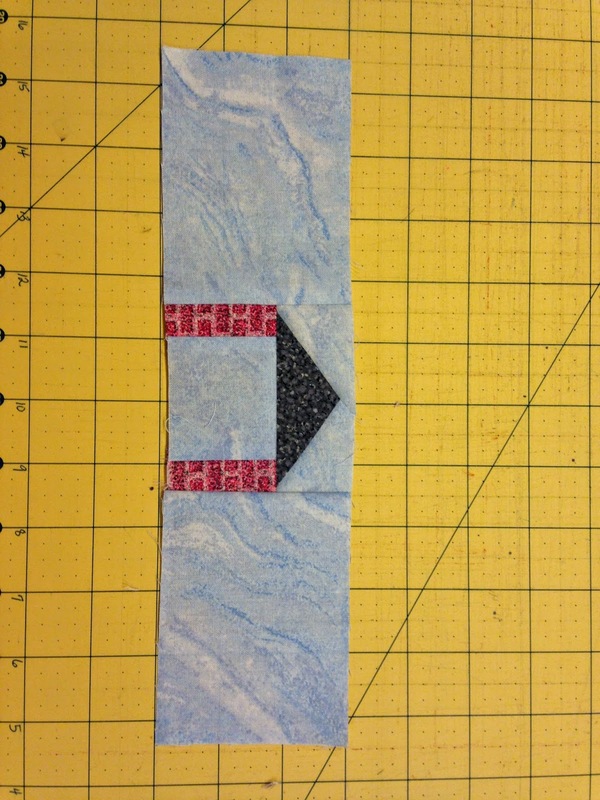 Draw a line diagonally across the background square, sew 1/4" away from the drawn line on each side. 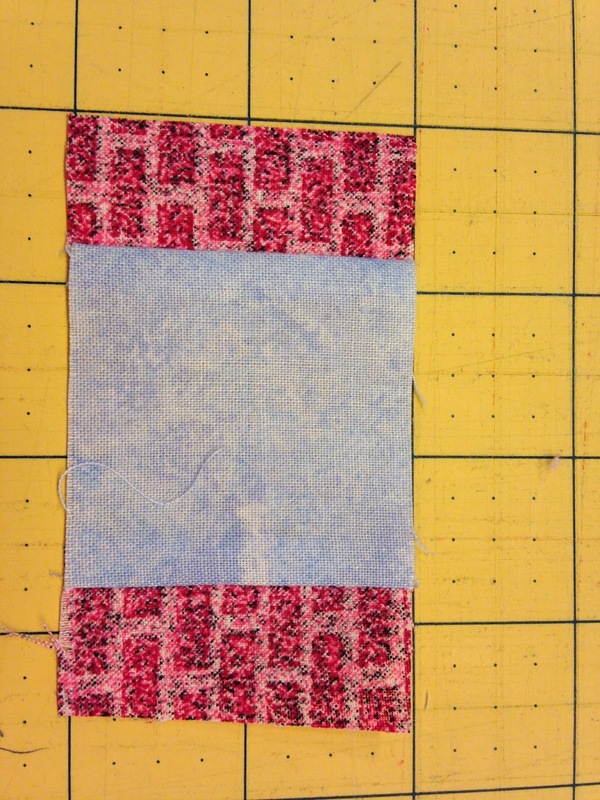 Cut apart, press to the dark fabric and square to 3"
3. 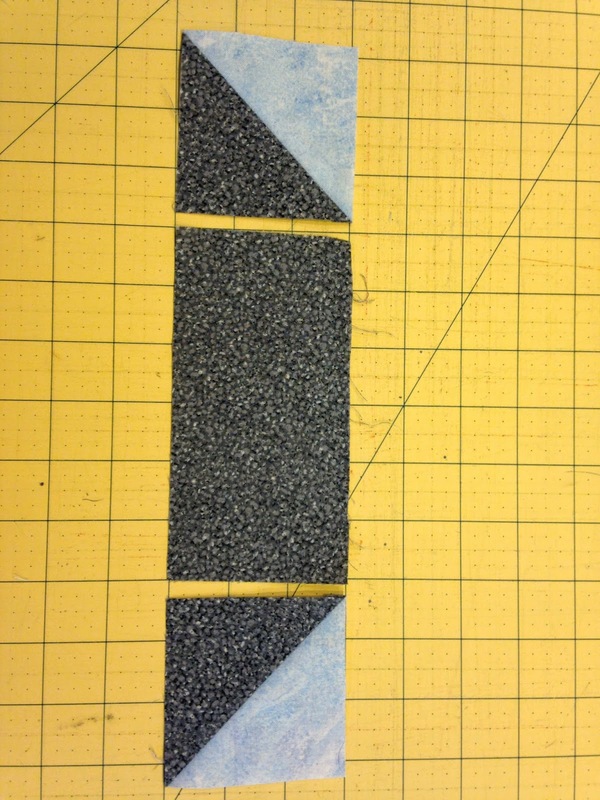 Sew a half square triangle to each side of the 3"x5" roof rectangle. 4. 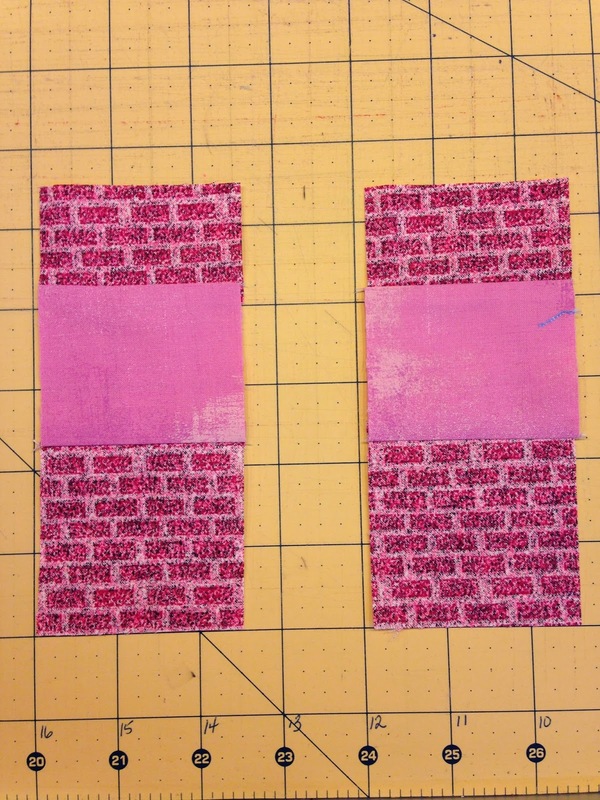 Sew a 1"x2" schoolhouse rectangle to each side of a 2" x 2 1/2" background rectangle. 5. Sew the cupola unit made in step 1 to the unit made in step 4. 6. 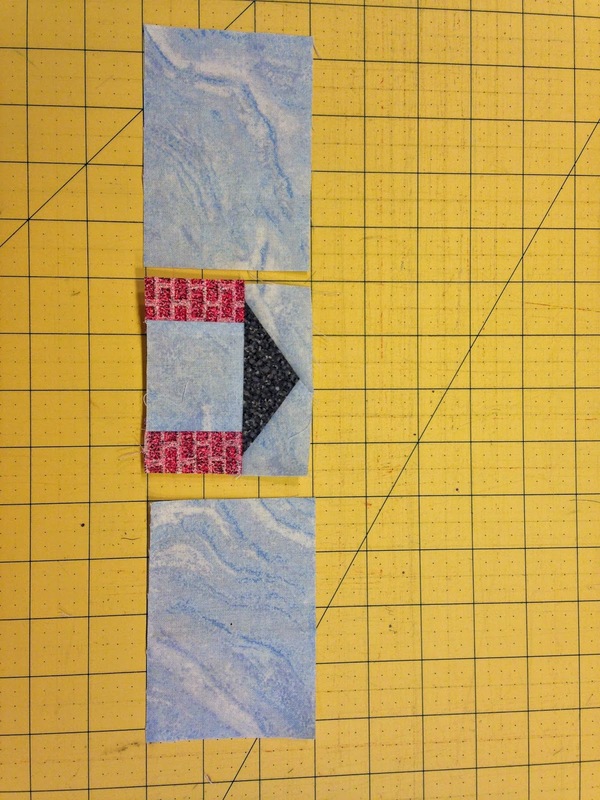 Sew a 3" x 4 1/4" background rectangle to each side of the cupola unit made in step 5. 7. 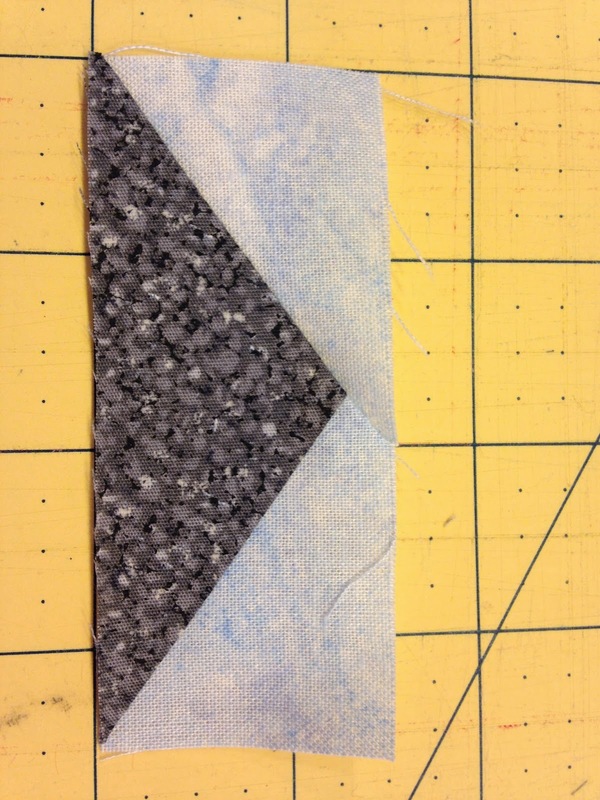 Sew this uint made in step 6 to the roof unit made in step 3. 8. 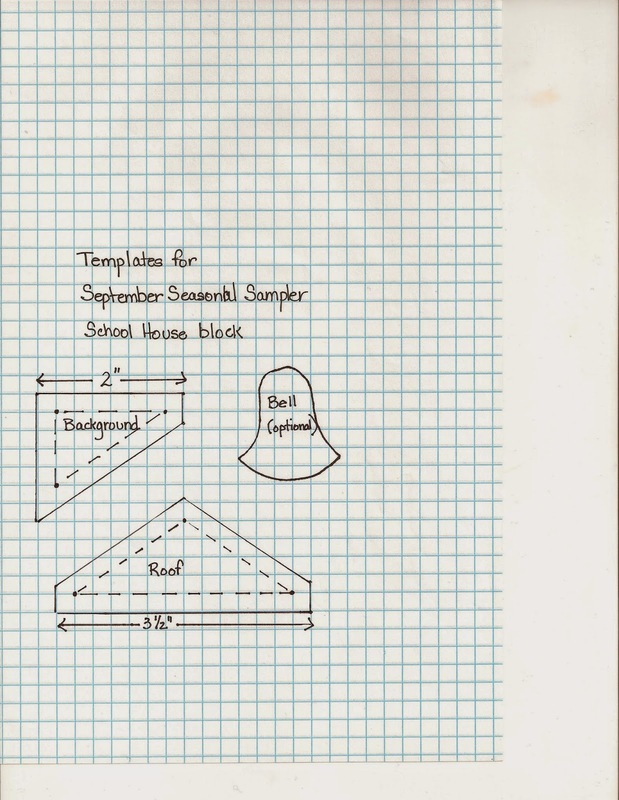 Sew a 1 1/2" school house rectangle to each side of a 2 1/2" window square. make 2 of these units. 9. 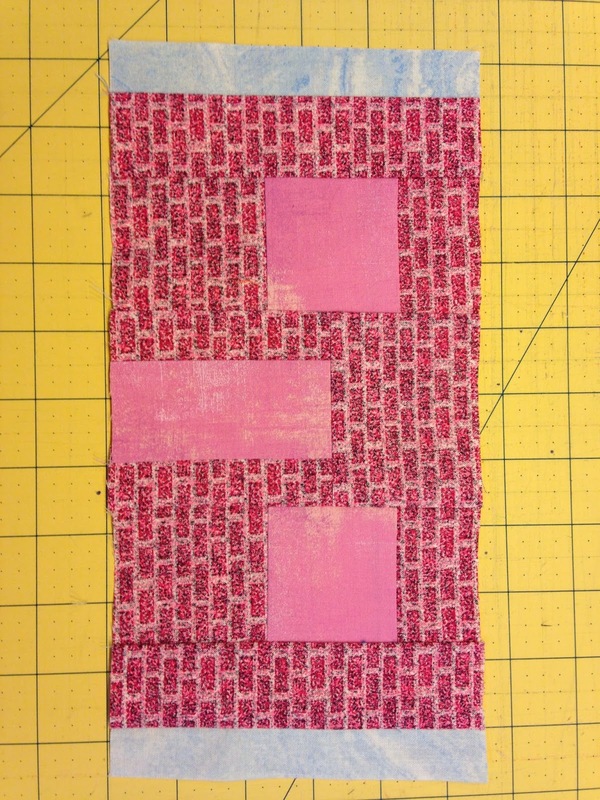 Sew a 1 1/4" x 3 1/2" school house rectangle to each side of a 2" x 3 1/2" door rectangle. 10. 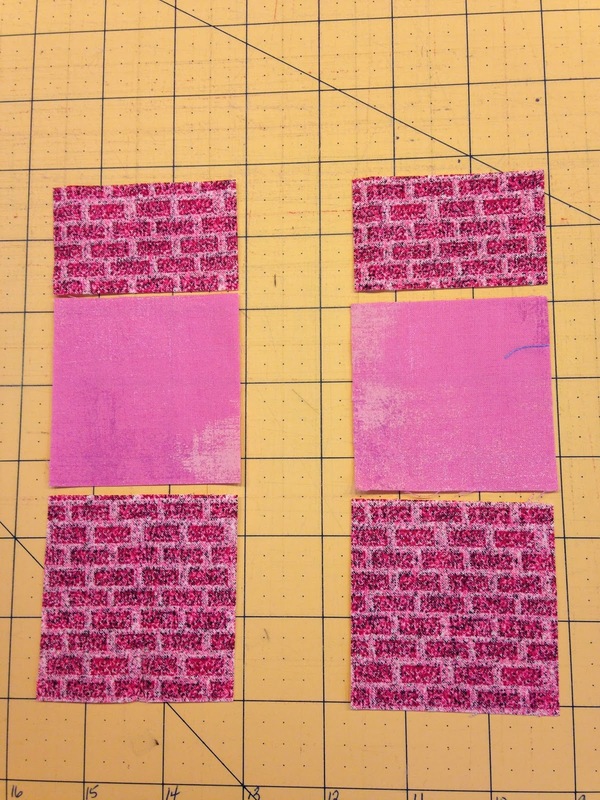 Sew a 2 1/2" x 3 1/2" rectangle to the top of the door unit made in step 9. 11. 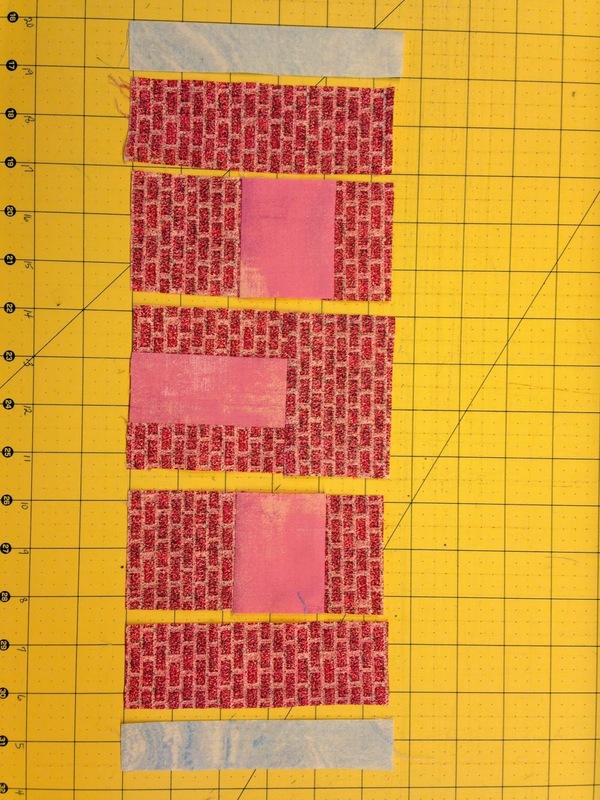 Now assemble the school house together with the units made in step 8 and 10, adding a 1" x 3 1/2" background rectangle to each side of the unit. 12. 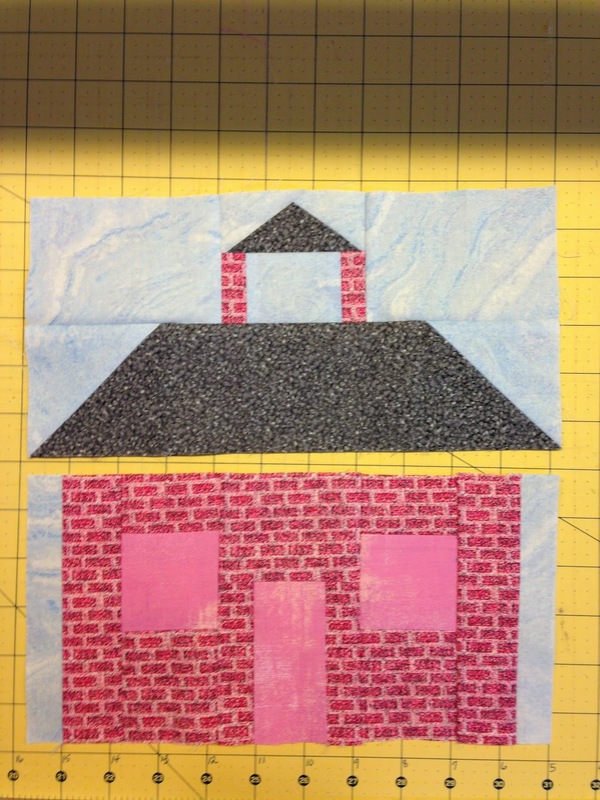 Sew the school house unit to the roof/cupola unit. 13. 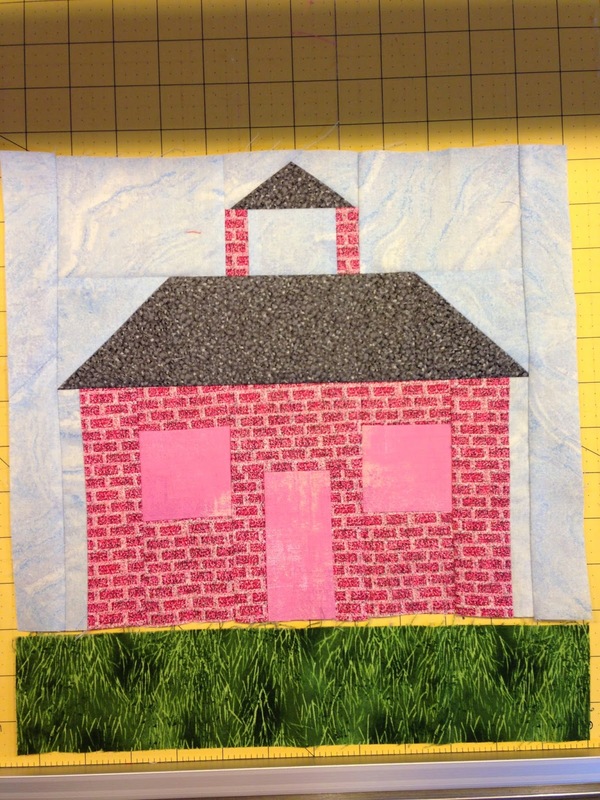 Sew a 1 1/2" x 10 1/2" background rectangle to each side of the schoolhouse unit and a 2 1/2" x 12 1/2" ground/grass rectangle to the bottom of the schoolhouse. 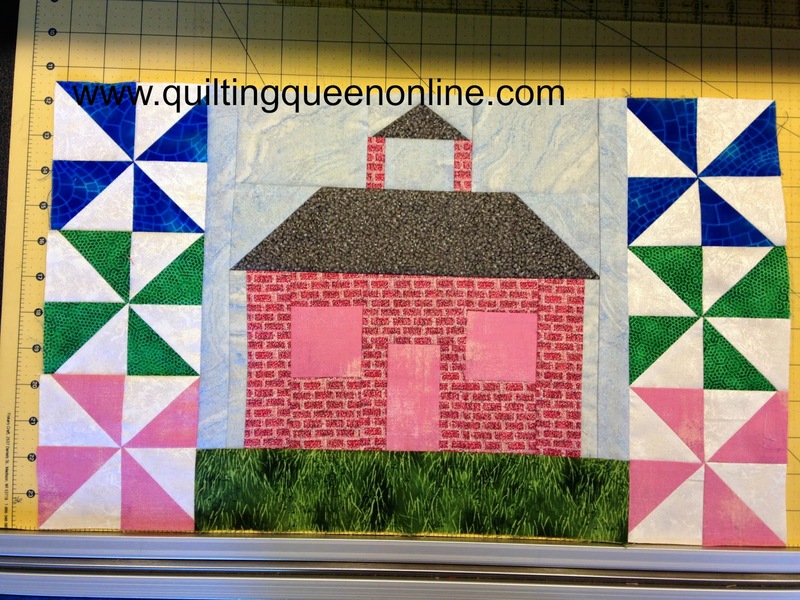 Now you're ready to make the pinwheel blocks that will go on each side of the schoolhouse. 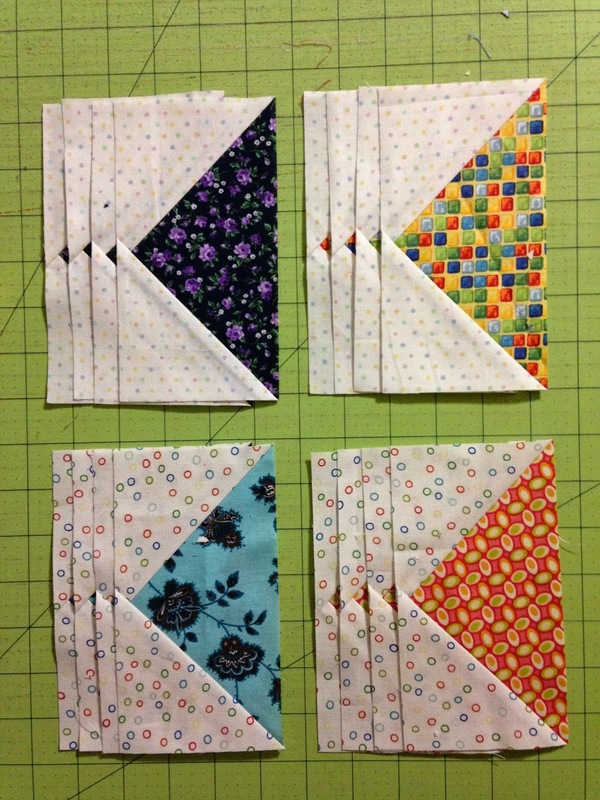 I forgot to take pictures as I was making the pinwheels but you've probably made pinwheel blocks before. I'll walk you through it, just no pictures. SORRY! 15. 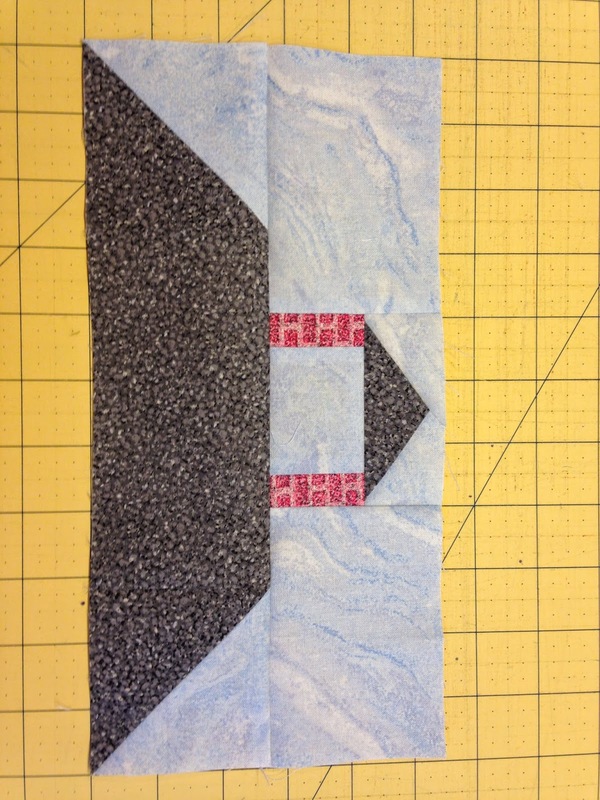 Pair 4 - 3" blue squares with 4 - 3" background squares. 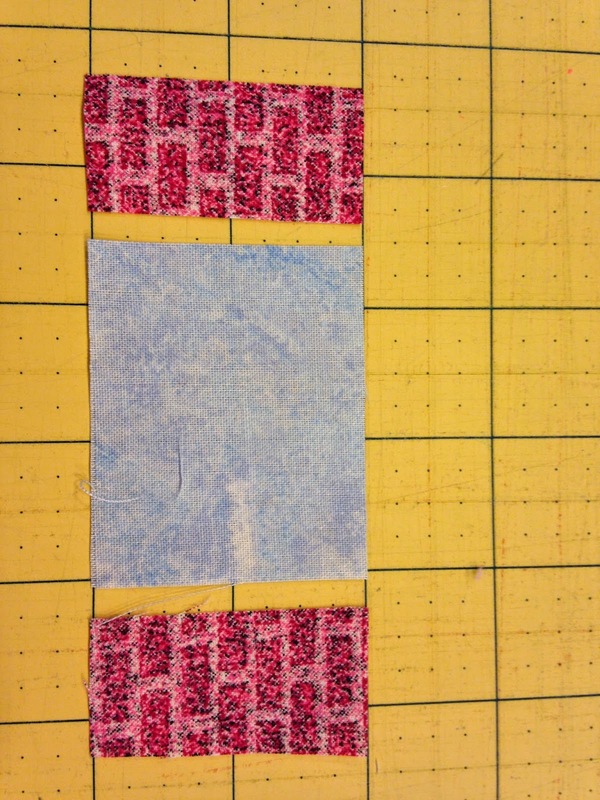 Draw a line diagonally across the background square, sew 1/4" away from the drawn line on each side. 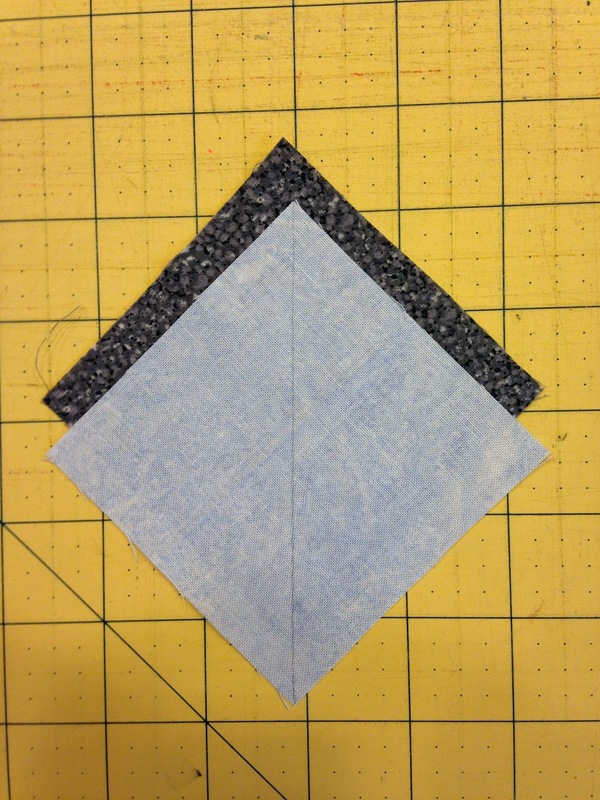 Cut apart, press to the dark fabric and square to 2 1/2" (as pictured in step 2 above). 16. 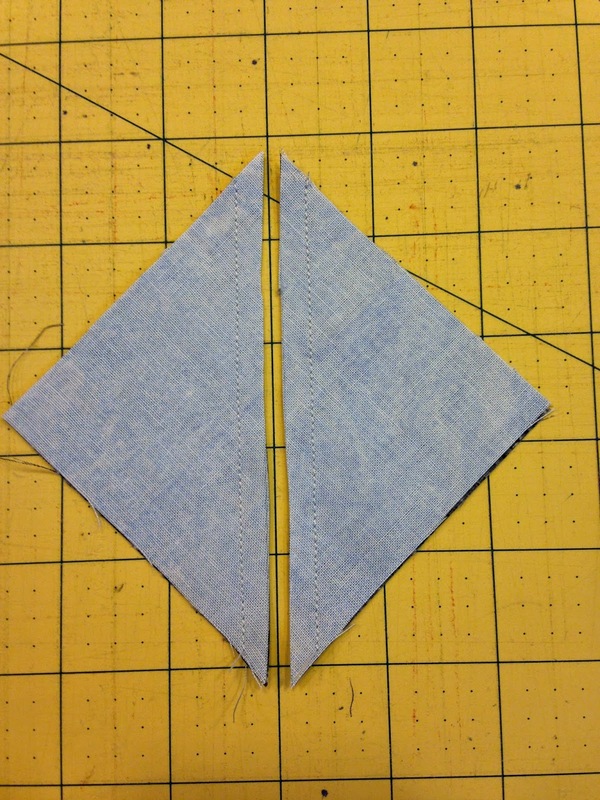 Lay out the half square triangles to form the pinwheel and sew together 2 to make a row. 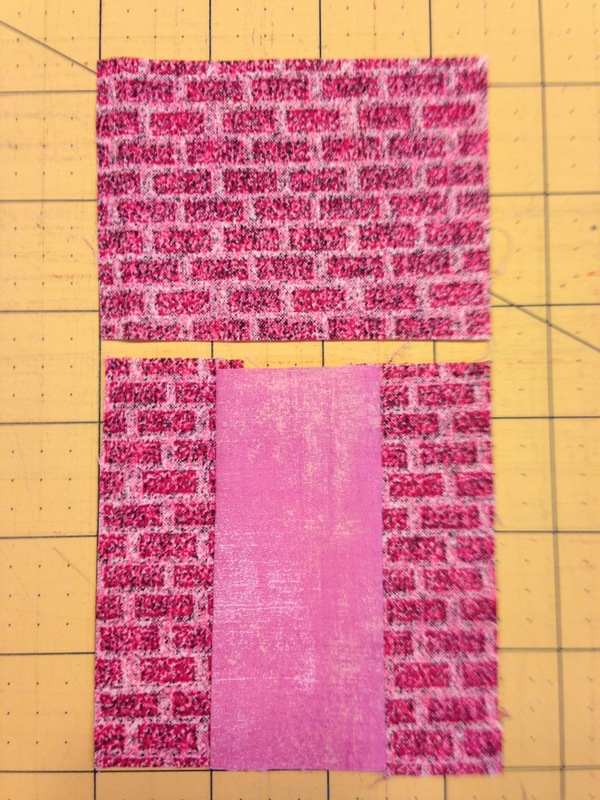 Repeat for a total of 4 rows. 17. 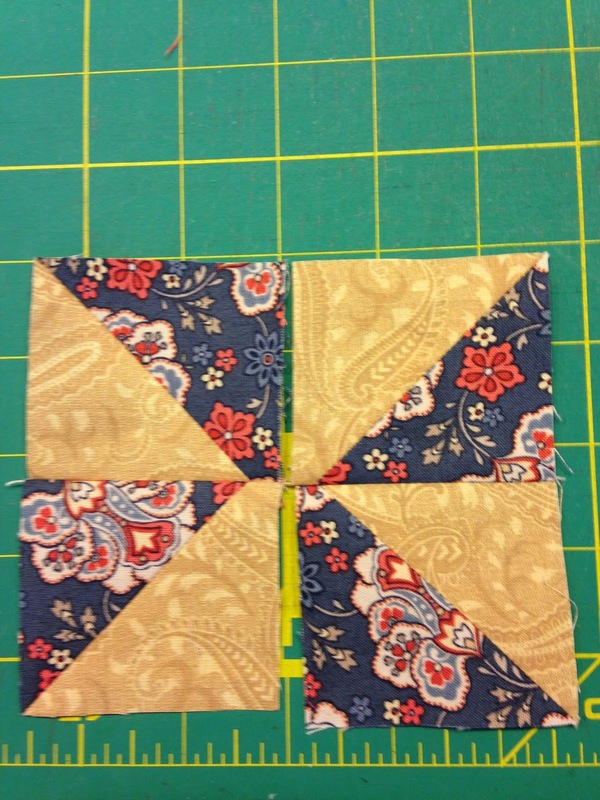 Sew 2 rows together to make a pinwheel block. 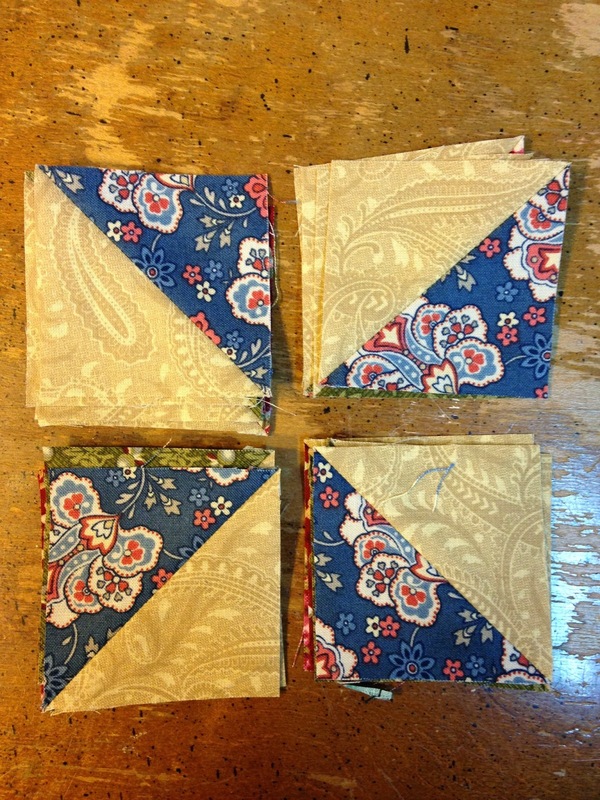 Repeat for a total of 2 blue pinwheel blocks. 18. 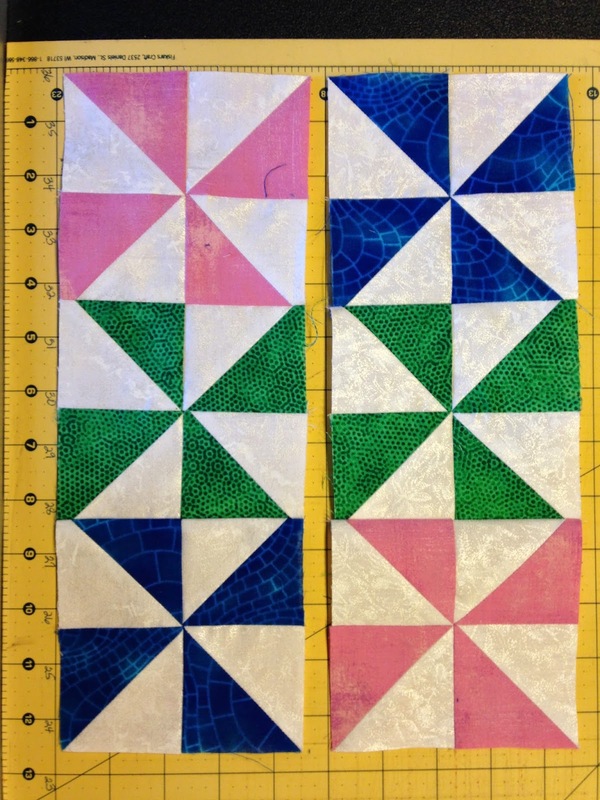 Repeat the pinwheel block assembly for the other 2 colors (pink and green). 19. 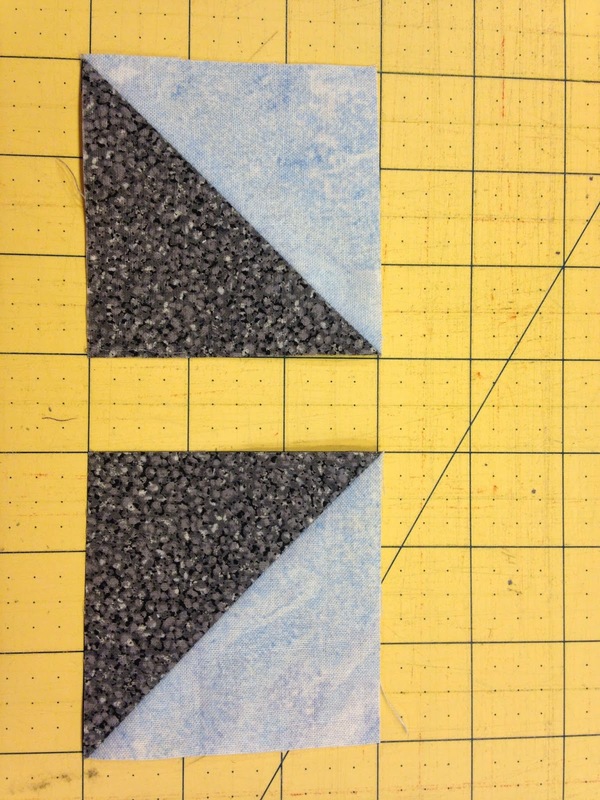 Sew 3 pinwheel blocks together to make a unit. Repeat for a total of 2 pinwheel units. 20. 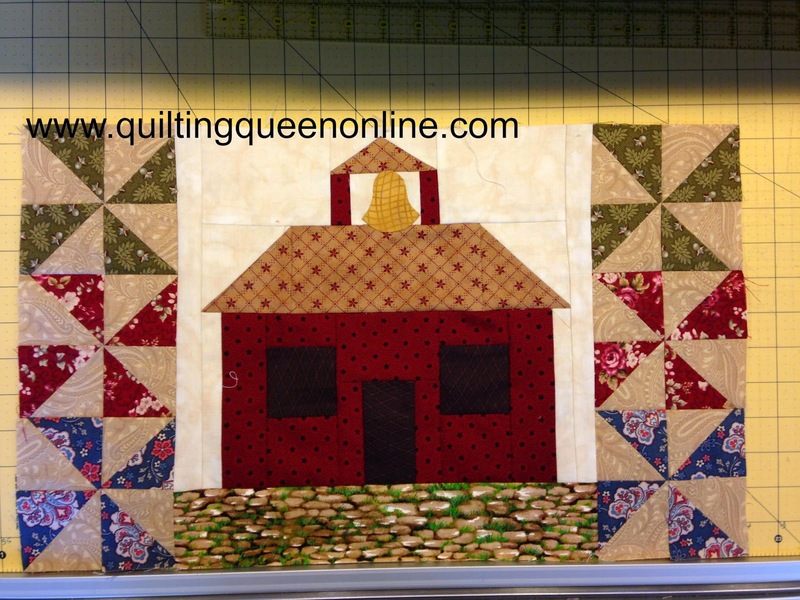 Sew a pinwheel unit to each side of the schoolhouse. Ta Da! You're done! Here is the second color way. 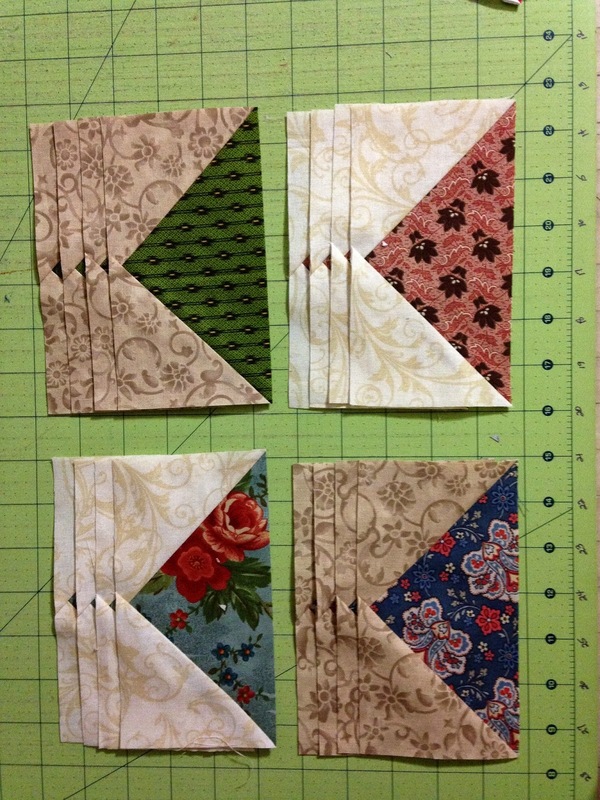 I also made 16 more flying geese blocks for each color way.